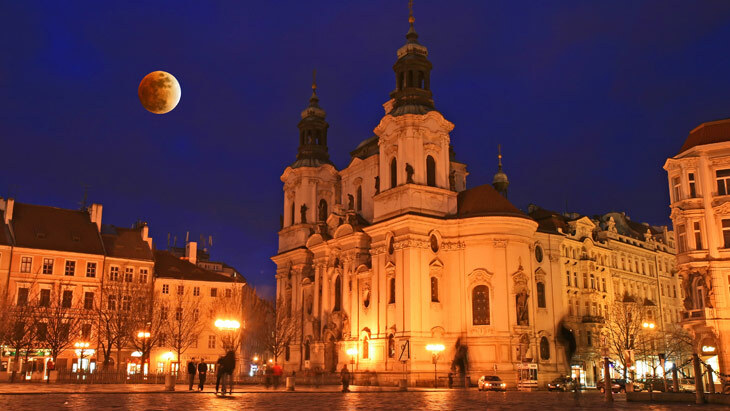 Church of St. Nicholas is located in Prague's Old Town Square. It was built in the Baroque style between the years 1732-1737 by architect Kilian Ignaz Dientzenhofer. The interior of the church is worth the attention due to the organ and ceiling frescos depicting the lives of the saints St. Nicholas, St. Benedict and motives from the Old Testament. They were created by Bavarian painter Cosmas Damian Assam in the years 1735-1736. The main altar made ​​of artificial marble is from 1737. The present church was built on the site of a Gothic parish church from 1273. St. Nicholas church formed a counterbalance to the church of Our Lady before Týn standing diagonally across the Old Town Square. There are only a few construction elements that survived from the original building in today’s dungeons. During the reign of Wenceslas IV the church became one of the Hussite and reformation centers. In 1635 the church was acquired by Benedictine monks from the the Emmaus monastery. Between 1730 and 1739, today’s church was built designed by Kilian Ignaz Dienzenhofer.